Auto Mag LTD Corp. is a firearms revitalizer with a mission to reinvigorate an American classic: the AutoMag pistol. To meet massive demand, we’ve obtained exclusive rights to the iconic firearm, its name, and reintroduced it to the market while making over 20 improvements. With improved design and functionality, the AutoMag pistol breathes new life into the look, feel, and value that Dirty Harry made famous through the pistol -- while not jeopardizing the historical essence. It was in August of 2015 that I bought the assets of Auto Mag from the Sandford family. At the time I thought that we would take the 500 or so frames and left over parts and build them into 4-500 Auto Mags and that would be the end of this project. 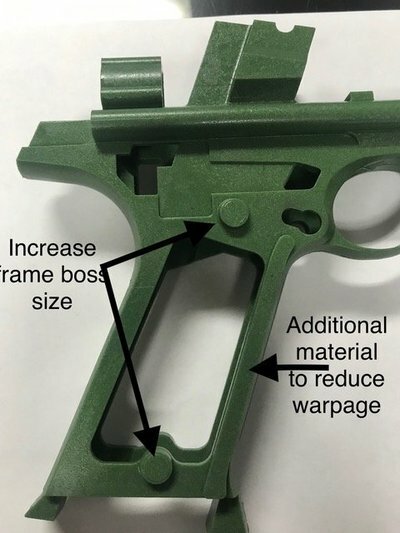 Obviously over time the original plan has greatly evolved to making a new and improved Auto Mag from new parts, using improved materials and manufacturing processes that mostly were not available back in the day of the original production. We also wanted to address some of the engineering issues that plagued the original Auto Mag while maintaining the original look and feel. I did not have a clue at the time what it would take in terms of time, resources and personal. If you would have told me I would have never even started but now that we have done it I could not be happier. The last three constraints to production are the magazine, the bolt, and the frame. Magazine- We have redesigned the magazine but have had multiple issues getting our vendor to do what we asked to the level of quality that we needed. They continued to make progress but they are still not making a consistent part so we just purchased our own Bliss 70C stamping press(see photo below) and hired a tool and die maker to help us produce this and almost all other critical parts for the Auto Mag in house. We will keep our current vendors to have a back up source of parts as well as to give us additional capacity. If the magazines are not ready when then gun is ready we will ship the first guns separately and the mags will follow. Frame- Originally we were going to use the old frames we purchased but due to warpage and other problems we were losing over 80% of the frames in production. We were lucky enough to find the Hitchner frame mold. This was the first mold made(there were three) but this was the one used on the Pasadena series of guns and considered to be the best but it did have one flaw and that was the frame bosses were not exactly in the correct position so they had to be welded before they could be finished. After our first run of castings we found this and had the mold modified to allow for larger frame bosses so the cnc could cut them in the right position. We also added extra material on thinner parts of the frame to allow the frame to cool evenly and prevent warping. (see photo -Improved wax master image & ) Finally, we added vacuum heat treat to improve the finish and prevent preciosity. Fifty of the latest version of the frames started being poured last Friday. We should receive them by the end of next week and start machining and tapping them for final assembly. As soon as we confirm these frame are correct they will start the next batch of 150. With no issues we could be assembling them over the following two weeks. Below are a few new minor improvements. Once we complete the first 50 we will start offering the opportunity to purchase guns in order that you have signed up. Initially we will probably only sell them in batches of 100. You will be allowed 24 hours to order if you don’t respond we will assume that you are passing. Would love to get one!" one in the early 80's. Truly ahead of it's time. " "Sorry I didn't buy one back when I was in the 82nd Airborne, back in the 80's. Army buddy bought one, been thinking about it ever since." "This in my opinion is the best looking semi-automatic pistol to this day, had the chance to fire off a full magazine when I was 15, I sitll want one. " "The holy grail... I have dreamt of owning one."